As the name suggests, preference centres are a place where a subscriber or account holder of a brand can manage their communication preferences, as well as update their personal information (such as name, email, home address etc.). 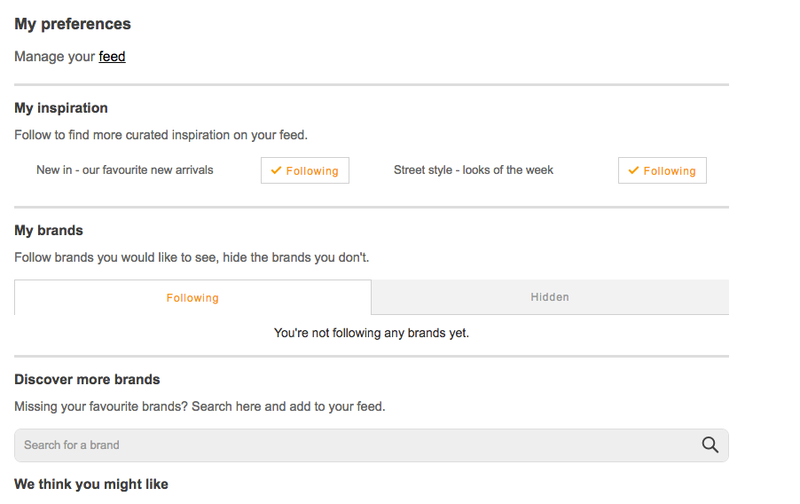 Preference centres can usually be found in: a welcome series, an email footer or the “My Account” tab on a website. From academia (e.g. Harvard Business Review) to journalism (e.g. Stylist magazine’s Emerald Street), today preference centres are used by industries across the board. However, for one reason or another (price? reputation for being a bit boring …?) there are still a number of ecommerce marketers that seem reluctant to invest in—or at least promote—their own. In this blog post, we’ve taken a look at four big reasons why preference centres actually deserve way more kudos (and care! )—backing up each point with examples from ahead of the curve ecommerce brands that are already nailing it. In a 2016 Ometria survey, we asked consumers what their top frustrations were when it came to email marketing. Of those we spoke with, 84 per cent said being sent “too many emails”, and 72 per cent said being sent emails “with products that are not of interest”. In other words, frequency and relevancy of content. A preference centre enables an ecommerce marketer to combat these frustrations by letting consumers sit in the driver's seat and decide what sort of emails/notifications they receive, and when. As shown in the screen grab in our introduction, Scoutmob is one brand including a link to its preference centre in the footer of its email marketing. Laid out in an easy to read grid, the brand lets recipients choose whether they receive product emails seven, three or one day/s a week, as well as decide whether they want “weekly wedding goodness from Shoppe”. 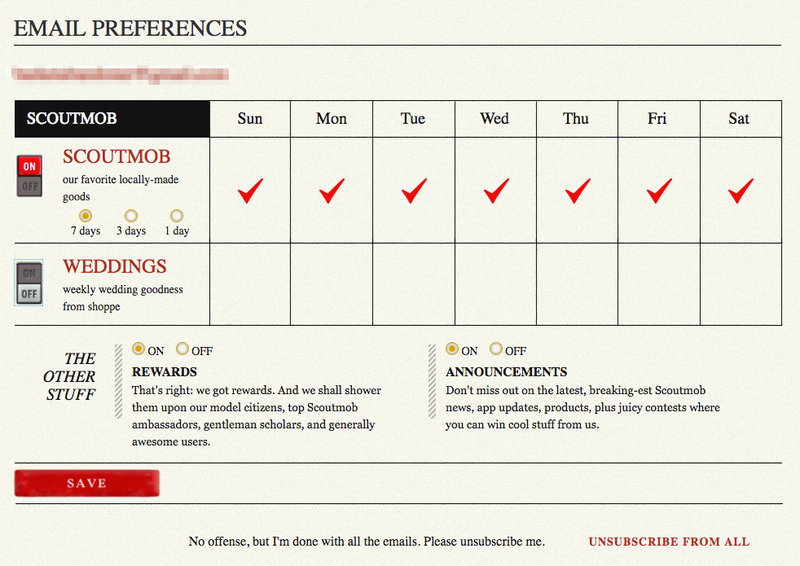 Using this centre, subscribers can also opt in for rewards and announcements, or actually just unsubscribe. 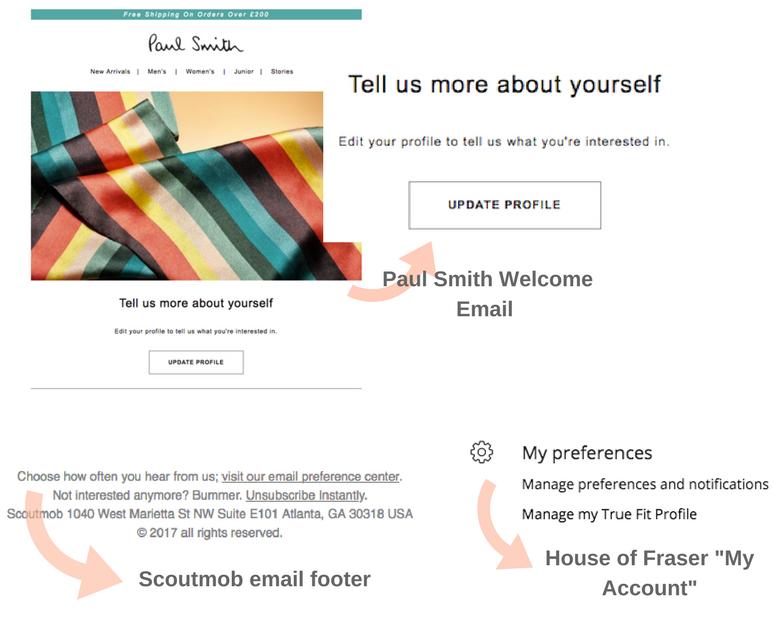 This same email preference centre is also accessible when a user logs into their Scoutmob account on-site, along with space for them to update their personal details such as full name, address and orders. 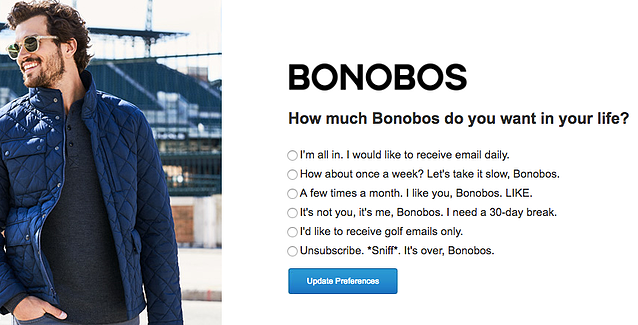 As you can see from the above screen grab, Bonobos uses humorous copy to communicate to a recipient that there are other options other than unsubscribing—for example, cutting down on the amount of emails or receiving “golf emails only”. In actual fact, this is not the same preference centre as the one used on the Bonobos website, which focuses more on personal information such as birthday and fit, something House of Fraser does very well—but more on that below. Similar to Bonobos' technique, this is a clever way to ensure recipients know they can change their settings opposed to opting out completely. N.b: It definitely helps that the design of this preference centre is slick and stylish, therefore likely to appeal even more to the brand's target audience of luxury shoppers. 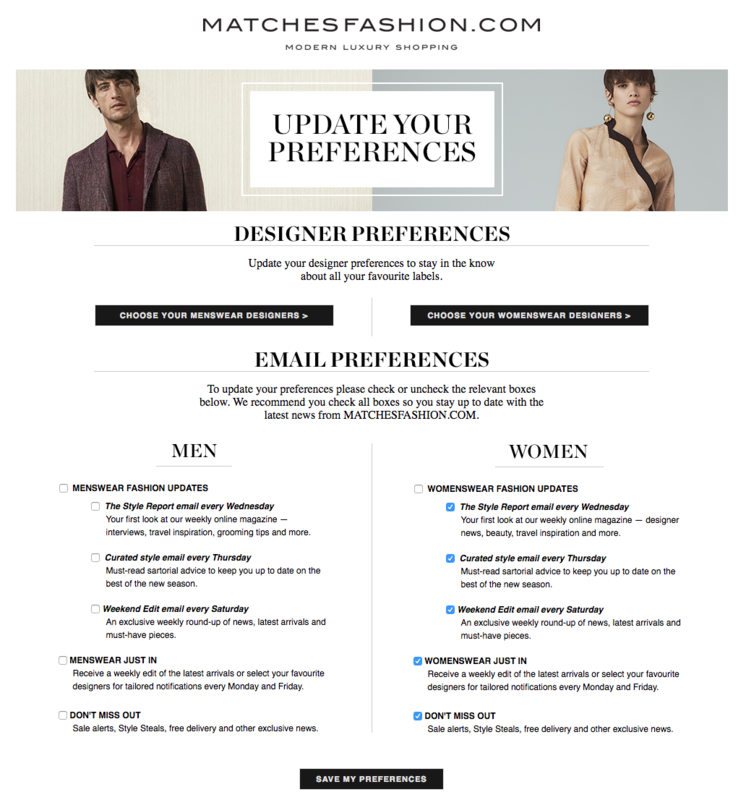 Whilst House of Fraser emails don’t link to a page like Bonobos’ when someone tries to unsubscribe (and instead just ask for the reason for unsubscribing), the brand does have a killer preference centre that can be found on-site. 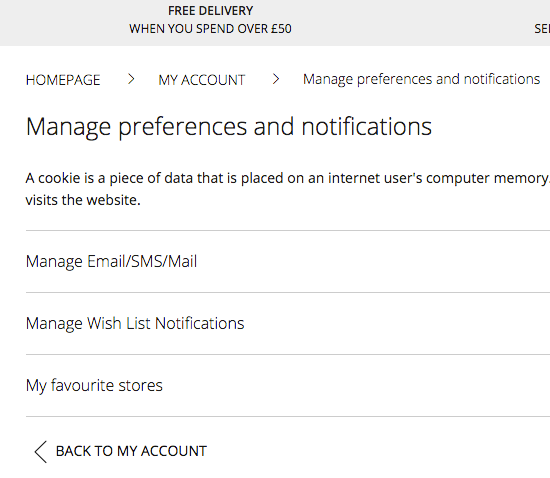 Once a user has logged into their account settings, they can a) manage which channels they receive marketing messages on, b) decide whether they want to receive notifications on wish list price reductions and c) specify their favourite offline stores—all useful information for a marketer and/or an algorithm powering personalised marketing messages. 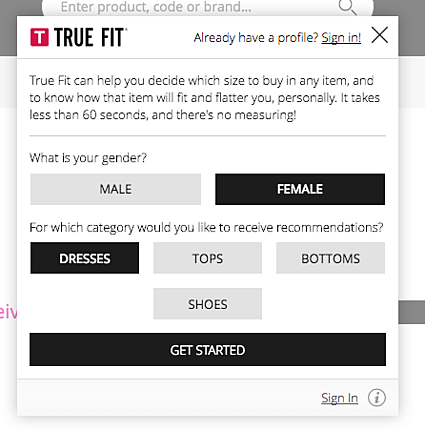 As well as managing marketing preferences and notifications, House of Fraser users can also use their preference centre to create a “True Fit” profile; this platform in turn helps a brand know which products (and/or size) to suggest to each individual customer. 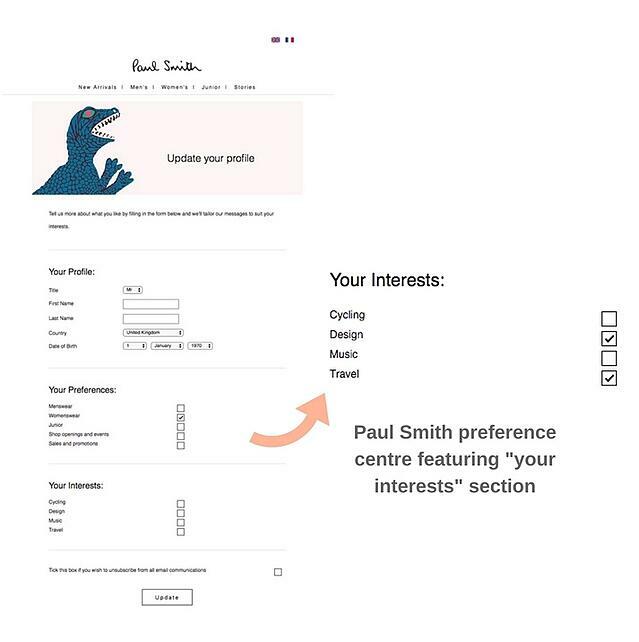 One brand moving beyond age, gender, location and body size is Paul Smith, who uses its welcome email to ask its subscribers about their outside interests. This is actually pretty valuable information, which could be used to determine the sort of content a subscriber is most likely to be most interested in (e.g. a blog post on design vs a blog post on sport). And that’s why we think they’re actually pretty ace.